Greetings my dearest ones! 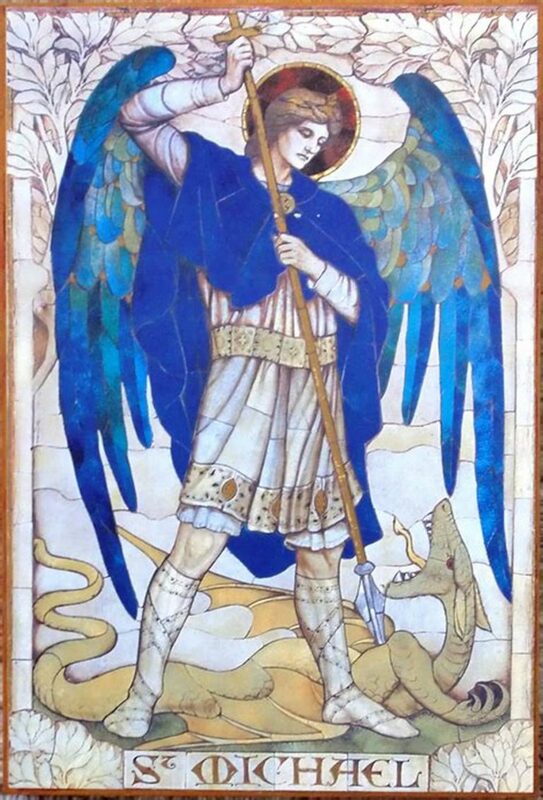 I AM Mi-ka-el, I AM Archangel of Love, Warrior of the Peace, Bringer of the Light and Truth, your protector and ally, your close family always. I come today to urge you, evermore, to use my shield and sword to help you better navigate through these chaotic energies. Take my cobalt blue cloak and protect yourselves early in the morning upon awakening, and every time you are to go out and meet the collective energies, because, yes dear hearts, with your bright light and beauty it is imperative that you reinforce and strengthen your protections and shielding. It matters not whether you go out exposing your brilliance by traveling in crowded places, or whether you extend your energy and presence on the internet – although social media is a wonderful way of connecting in many ways, it can also be very detrimental to the integrity of your energy field – you do need to take preventive action so that you do not get drained and depleted. Each and every one of you knows when that is happening, and it can be a gradual and insidious process of losing stamina, your inspiration, and joy of life. But dear hearts, you do not have to sit and keep taking this on as being some type of service that is required of you, and then extend yourselves even more. We know your beautiful and giving hearts want to assist and uplift everybody. However, the Mother is not asking, and we are not asking, you to serve in this manner at the risk of depleting your sweet selves. It is time for you to step into your Divine Authority so that when less than friendly energies come to you, you just push them back and away from your field. Return them to their source by reflecting their energies back to them by using my mighty shield, and also send them up to the Mother to be transformed and transmuted into light. You do not have to allow them to come into your field to be transmuted as if this were your duty and responsibility. It is not! Be very clear and say “no” to anything that doesn’t belong to you! At the same time, let the owners of these energies know, in a very kind but firm way, that this kind of behavior is not allowed any longer. Understand that you are not to take on any of the half-truths thrown at you, as others try to imply and to convince you that taking on their heavy baggage is how you help yourselves and humanity and that by doing so you are serving the Mother. This human collective ascension doesn’t have anywhere in its designed plan the intent that some should work hard while others get a free ride by deceiving people and working covertly to take the light of others. State your truth, let them know who you really are – ascended, strong, and powerful beings of light – and then call on me and on my brother, Jesus, and allow us to take care of their future journey on this planet of living in duality and free will. You have to understand that the false grids of guilt and manipulation that are deceiving you, and other loving and giving hearts, have huge long tentacles, and very fine entangling ramifications that have to be recognized and removed, extracted and discarded as soon as possible. I will remove them from thee…which has already [been] done for many of you here in this forum. But you do have to be the ones to refuse to take them back, or willingly return into the shadows of the collective humanity. Do not allow some small remnant debris of your core issues, if you are still holding onto them, to convince you that you have to sit and process for extended periods of time. And more so, do not take on other similar energies in a false belief that it is helping with the acceleration of the clearing and cleansing of planet Earth’s energies. You are most effective in your service when you hold the maximum light quotient energy that you are capable off, uplifting everyone with your joy and light demeanor, while setting firm boundaries and maintaining your heart-based balance. Yes, you can assist and extend your love and healing energies to others in need – when asked – but that doesn’t mean you have to willingly take their heavy energies onto yourselves. You do send love in a kind and compassionate way, and at the same time, you set around your sweet selves an impenetrable shield of light that doesn’t allow anything that is less than love to come back to you. Say “no” and mean it, using the sword of light when needed! No more trespassing and second-guessing yourselves. You have the knowing and the certitude that honoring and loving your sweet selves is what you need to do first and foremost. And if something feels unloving to your selves, if it feels like you are making sacrifices or going against yourselves, then it is not of service, and is certainly not something that the Mother will ever ask you to do! We need your love and joy, dearest hearts! We need you in your full power and strength for the next phases of building and constructing Nova Earth! I will close this message now, leaving you with my love and strength! Farewell! This entry was posted in Uncategorized and tagged Archangel Mi-Ka-el, archangel of Love, flasr grids of guilt and manipulation, Geneva Coyle, love, love with an impenetrable shild of light, return negative energies back to their source, step into your Divine Authority, take preventative action to avoid being drained. Bookmark the permalink.